This operation involves converting the stomach into a long, thin tube by stapling it along its length and excising (removing) the excess stomach. 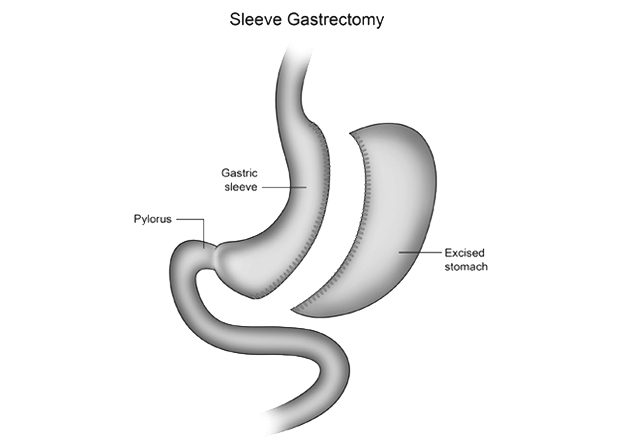 Unlike a gastric bypass where food enters a small pouch and then passes straight into the small bowel, the route that food takes following a sleeve gastrectomy is the same as it took before surgery. As the stomach is smaller, it is able to hold less and stretches more quickly to give a feeling of fullness and satisfaction. So patients who have had this procedure want to eat less and therefore lose weight.